TM 9-2350-261-20-2 R E P L A C E B A T T E R Y C O V E R A N D G R O U N D L E AD (M113A2, M741A1, M901A1, AND M1059) DESCRIPTION This task covers: Remove (page 13-3). Clean, Inspect, and Repair (13-4). Install (page 13-4). INITIAL SETUP Tools: General Mechanics Tool Kit (Item 30, App D) Battery Terminal Cleaner (Item 13, App D) Battery Terminal Puller (Item 46, App D) Materials/Parts: Grease (Item 18, App C) Sodium Bicarbonate (Item 55, App C) Grommet Personnel Required: Unit Mechanic References: See your -10 Equipment Conditions: Engine stopped/shutdown (see your -10) Carrier blocked (see your 10) Ramp lowered (see your 10) REMOVE 1. Release two latches (1) on side of battery box (2). Lift and slide cover (3) from three grom- mets (4) on rear of battery box. Remove cov- er. WARNING Gas from batteries can ex- plode. Ventilate compart- ment before you disconnect or connect battery cables. Battery acid can burn or blind you. Do not get acid on your skin or eyes. ALWAYS disconnect ground lead (circuit 7) first and connect it last. 2. 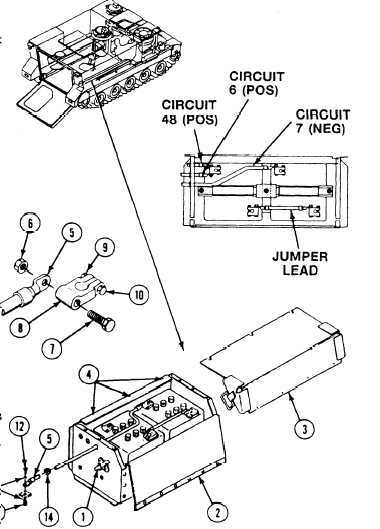 Remove circuit 7 lead (5) as follows: a. Remove nut (6) and circuit 7 lead (5) from screw (7) on terminal lug (8). GO TO NEXT PAGE 13-3 b. loosennut(9) from (10) and re- move terminal lug(8)from battery post. use battery terminal puller.